The ornate architectural details and exquisite stone carvings are masterpieces. I found the seductive dancing female ("apsaras") sculptures ringing Angkor Wat to be particularly arresting. It was constructed in the jungle in the early 12th century, then - two centuries later - was mysteriously abandoned by the Khmer civilization. The jungle soon overwhelmed Angkor Wat, hiding it for several centuries with thick tropical foliage. There was little left to see except an occasional protruding building stone. In 1861, a French naturalist accidentally came across the jungle-veiled ruins. Eventually archaeologists cut back the overgrowth, exposing Angkor Wat's magnificence. Sadly, much of what was rescued and restored over the past century fell victim to recent civil warfare. Structures and carvings deteriorated when - through human neglect - the jungle repossessed the previously saved Angkor structures. Cambodia is now making a conscientious effort to once again reclaim key Angkor sites from the destructive jungle. Do it in the afternoon for two reasons. Most tourists begin their Angkor complex tour at Angkor Wat in the morning and then visit Angkor Thom and Ta Prohm in the afternoon. The famous Angkor Wat entrance (see photo above) is best photographed in the afternoon because the sun is behind you. In the morning, it will be in front of you, degrading your photo. 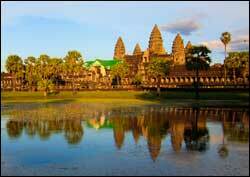 However, you must visit Angkor Wat in the morning if you want to see the sun rising behind the ruins. Photographers love this Angkor subcomplex. It clearly shows the on-going destructive forces of untamed jungle growth. The roots of banyan trees appear like giant octopus legs as they slowly entangle large buildings. It's the tiny jewel of the Angkor environs. The Banteay Srei sculptures are outstanding. Although Angkor Thom covers considerably more area and might have been grander than its neighbor Angkor Wat, its components are not as accessible and well preserved. It is more of interest to archaeologists than tourists. You have many hotel choices, ranging from budget to luxury. The Sokha Angkor Resort is one of the most attractive, best-valued, and well-located quality hotels in Siem Reap. Click Sokha Angkor Resort to visit its website for photos, description and room rates.